That’s Amore (Gluten-free pasta from PastaMore)! I’ve always loved tomato sauce. Pasta, as my friend Sarah points out, is just a vehicle of delivery for sauce. I ate sauce by the spoonful as an after-school snack. My mom made sauce with fresh veggies from our garden but I wasn’t picky; through college we ate Ragu or whatever was cheap. although I have moved away from the cheap sauces of college towards Muir Glen, Newman’s Own and even Classico. Despite this love of sauce, I’ve gotten kinda bored with gluten-free pasta. I don’t really like the corn pasta (just seems like a lot of starch without much nutritional umph), quinoa pasta is alright, and brown rice pasta is usually my default since its cheap and easy to cook with little attention. Does it bother you when you go to a nice restaurant and they offer gluten free pasta? No, I’m delighted. Although a little miffed that when they substitute brown rice penne for their handmade pappardelle that not only are you saving them money but they decide to gouge you an extra $5 for it. Ok, not all restaurants are like that but perhaps you can relate. So, the real story is the days of boring GF pasta may be over!!! I sampled PastAmore’s gluten free pasta tonight. I tried it with salt, butter and cracked pepper. 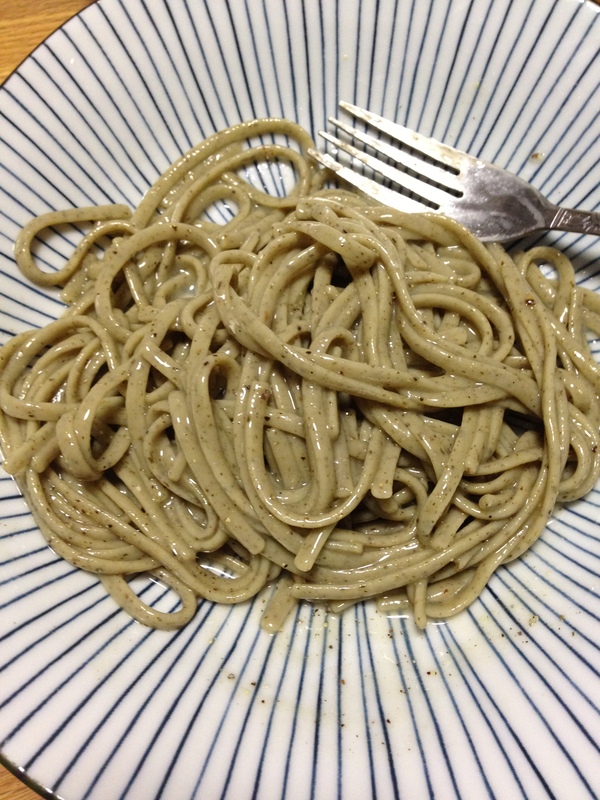 I tried it with homemade pesto. I tried it with sauce. It was great! The noodles are super long, I had to break them in quarters to get them in my 8″ pot of water. A single package contains 6-8 servings (in my opinion, although the package says 4). I sampled the spinach basil garlic linguini, which is made with rice flour, eggs, xantham gum, garlic, spinach and basil, black pepper and EVOO. Total cooking time was about 12 minutes and the pasta came out perfect just by following the directions (you know that’s not always the case!). The aroma was great while cooking and I really enjoyed the change. Shown plain, with butter, salt and pepper. Delish! 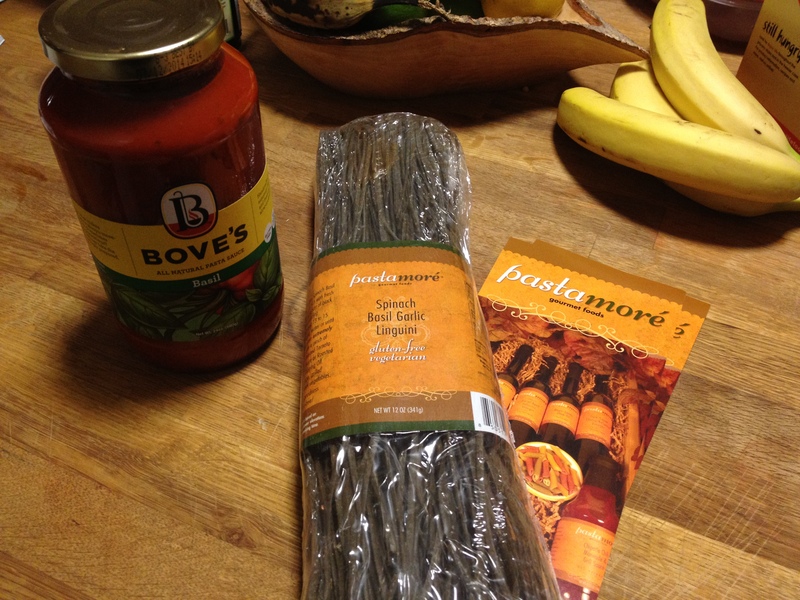 This entry was posted in pasta and tagged Boves, pasta, PastaMore, sauce on October 10, 2012 by gfvermont.